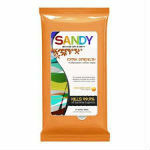 Get a free sample Pack of Sandy’s Extra Strength Multipurpose Surface Wipes. Sign up by filling out the request form to receive a free sample pack. I would like to test the multi surface wipes at my house, please send free sample. Thank you.